How does your family eat mushrooms? If you’re looking for more ways to get your kids interested in this versatile, tasty fungi, now’s your chance. 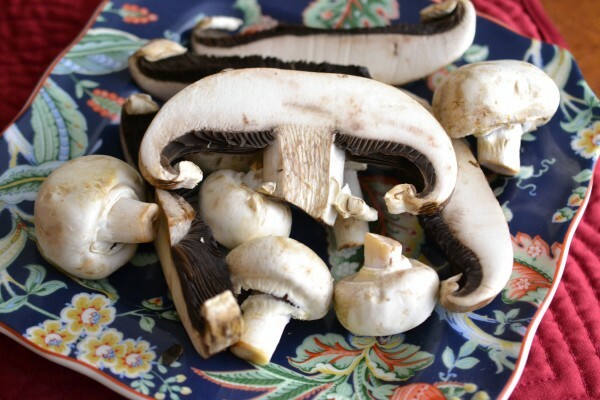 March is National Nutrition Month, and the theme is, “Eat Right, Your Way, Every Day.” As part of National Nutrition Month, the Mushroom Council is promoting mushrooms as a way to get your vitamins D and B as well as antioxidants and fiber. In the Jolly Tomato household, we often keep mushrooms available in the fridge so we can add them to anything at a moment’s notice… omelets, sandwiches, stir-fries, etc. Thanks to their hearty texture, mushrooms are also a great addition to meat fillings and sauces. They add a great nutritional punch while making your meat stretch a little farther. Would you believe there’s a whole web page devoted to the “swapability” of mushrooms? You can find mushrooms here in everything from tacos to burgers to crab cakes. Lately we’ve been focused on incorporating more veggies and other healthful foods into breakfasts – shifting toward savory rather than sweet breakfasts. 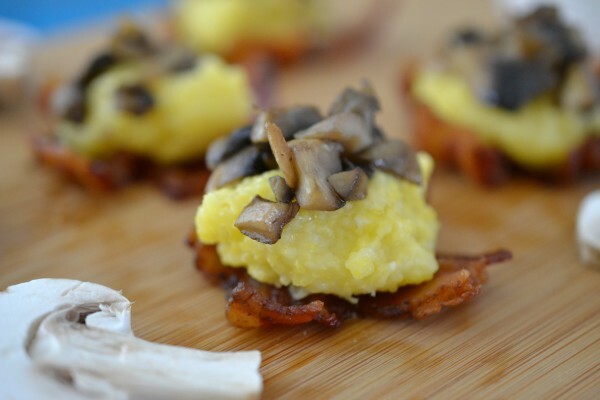 Chef Joe gave us the idea for these Most Awesome Mushroom Polenta Bacon Bites, and the more we ate, the more we wanted. The best thing about these mushroom bites is that they’re easy to eat and filling, so you can grab one on the way out your door and get your day off to a good start. And because…bacon. Preheat the oven to 350 degrees. Slice the bacon strips in half. Arrange the bacon strips in muffin tins so that two pieces of bacon are in each tin, lying flat in an “x.” Bake the bacon for 30 minutes or until crisp. Meanwhile, heat the olive oil in a large heavy skillet. Saute the mushrooms, stirring frequently, until they are soft and dark and set aside. Heat the polenta in a double boiler and sir in the butter and grated parmesan cheese. Add additional salt to taste; remember that the bacon will be salty. Assembly: Set the bacon crosses on a platter. 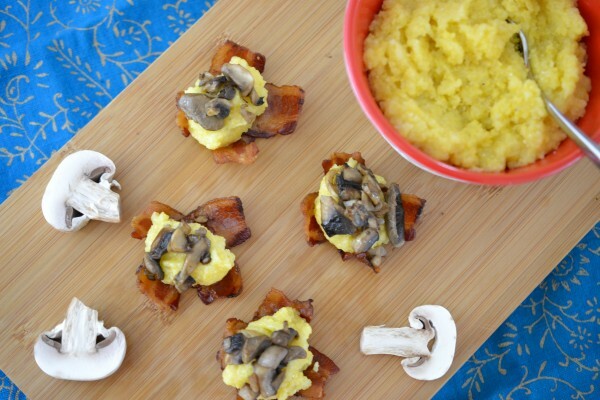 Top each bacon cross with a dollop of polenta and a spoonful of mushrooms. Serve immediately. Serves 6. Note: To prepare dried polenta, bring 4 cups of water and 1 tsp. of salt to a rolling boil. Add 1 cup of polenta and stir until thick. Continue cooking polenta over a double boiler, stirring frequently, for 25 more minutes. Add 1 T. of butter and stir until combined. Want to stay in touch with all things mushroom? Check out the Mushroom Channel (the social media sites for the Mushroom Council) on Facebook, Twitter, and Pinterest. If you want a chance to ask questions or pass along your favorite way to eat mushrooms, watch for a Twitter party on Wednesday, March 20 from 8:00 to 9:00 PM EST. The hashtag for the party will be #MushroomDish. 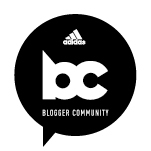 Blogger Disclosure: This post was sponsored by the Mushroom Council. All opinions expressed are our own. Loved the photos, esp 1 & 3. Can’t wait to taste the polenta bacon bites!